Lately, I've been adding a splash of rosewater to strawberry smoothies, which adds just nice fragrant touch. If you've never tried adding a bit of rosewater to drinks or food, I'd highly recommend experimenting. (In the Middle East, India, and Central Asia, rosewater is frequently used to add a light sweetness aroma to desserts, savory dishes, and drinks.) The trick is to start out with just a tiny bit, or else the scent can be overpowering. Try a teaspoon or less the next time you make a smoothie, shortbread cookies, tarts, or cocktails. When you're shopping, look for food-grade rosewater without additives; Mymouné and Cortas are my preferred brands. Have you ever tried using rosewater in cooking or drink-making? 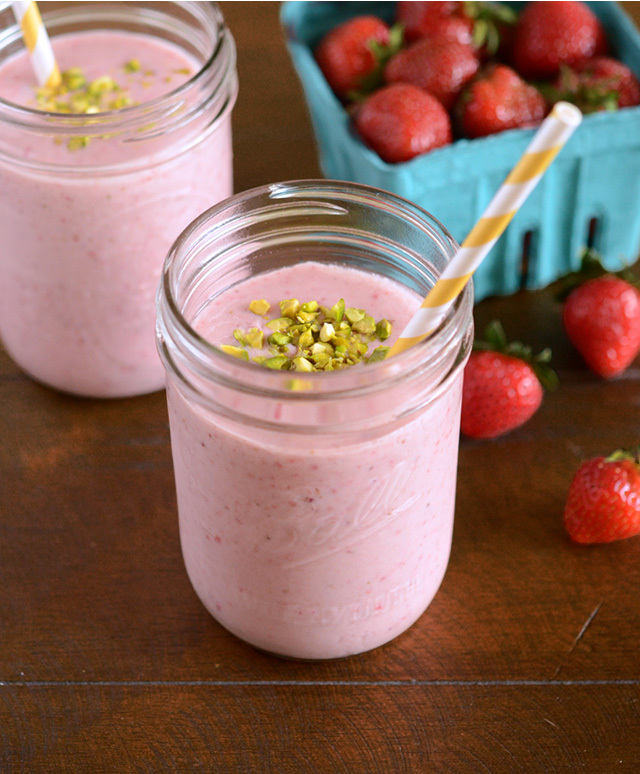 Combine the strawberries, banana, yogurt, almond milk, honey, and rosewater in a blender and blend until smooth. Divide into glasses and top off with the chopped pistachios if using.